Low Tech Drip Irrigation for Houseplants. Photo: © Marie Iannotti (2007) licensed to About.com, Inc. Note: The PlantWatcher is no longer available. 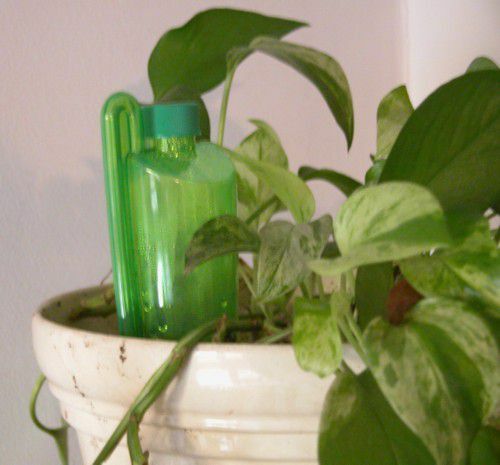 The PlantWatcher is an easy to use tool for one of the most forgettable gardening tasks - watering your houseplants. It takes a little thought to get started, but once you get it right, you can forget about it for 3 weeks. If your houseplants are begging you for more attention, the PlantWatcher is a low-tech automatic watering system you should look into. Keeps plants watered during vacations. Waters the plant at the roots. Can be used to fertilizer too. Too large to hide behind smaller plants. Sometimes 3 weeks is not enough. Basically a reservoir with a wick/sensor that sits in the soil and 'senses' when water is needed. A flexible tube allows you to direct the water and release it near the plant’s roots. Good for people who forget to water, but also great for people who tend to over water. Comes in 3 models sized for 6" to 12" pots. Clear green plastic looks like it will stand out, but actually blends in well with most plants. The bullet points pretty much tell you what this tool is. It’s simple enough to set up and install and since my Marble Queen Pothos plant was not wilting, it seems to have been a big success. Although I’m not the type to run out and buy a lot of little devices to make up for my bad habits, I probably will add a PlantWatcher or 2 each year, for the houseplants I really value. What Can Cooperative Extension Do for Gardeners? What Garden Shovels Should I Use?